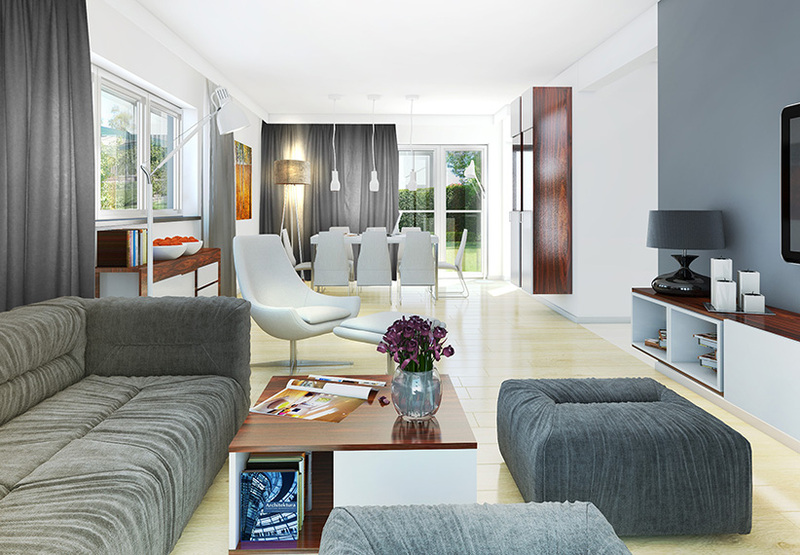 Choosing the design of a house to call your home is a very personal process. 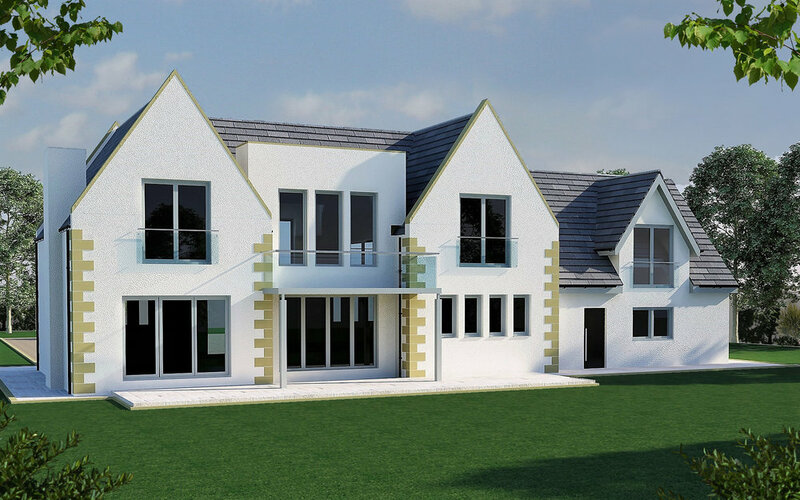 Within the constraints of the existing Rowallan Castle Estate and the planning permission granted for these new houses to be constructed, there is a huge variety of choice for how your house looks and the accommodation that it will provide to you and your family. Houses may be custom designed to suit each house buyer's lifestyle perfectly. With modern features like triple glazing and super-low energy running costs as standard and many other options to consider such as double height spaces, wooden staircases, media rooms, guest suites and a wide range of luxury flooring, tiling and other finishes and fittings - our project architects will take you through the choices and help you to visualise your final home. Whichever route you would like to go we are here to make it easy for you. Our carefully selected designs start from around 140m2 / 1,500sq/ft but can accommodate a size as large as you like. Our flexibility allows us to easily amend your chosen house to suit your plot requirements and lifestyle. The prices quoted below are for the standard house design, are valid as at September 1st, 2018 and are subject to change. Prices for these house types are indicative only if you select a different plot number and fixed prices are also dependent upon the house design not changing from its standard form. If the standard house design is modified by you then we will advise you of the revised cost budget and we reserve the right to remove the fixed price offer. House prices shown below are a fixed price (unless customised) and include the land plot and services costs on the plot numbers indicated. 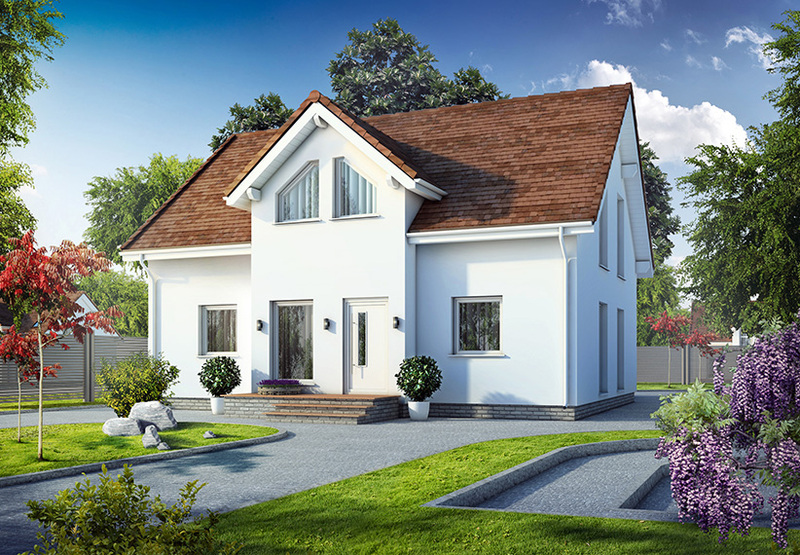 The prices include the finished house, standard flooring, tiling, all sanitary ware, plot at the specified value, planning and building warrant, on-plot service connections, foundations and standard landscaping (lawn, drive and paths) - everything that you need to move in apart from furnishings. These costs are exclusive of VAT and additional ancillary transactional costs which are standard for any normal property purchase. Additional services are also available to you, such as custom landscaping, garages (subject to plot size and where not already included in the house design), customisation of your house design and interiors and much more. 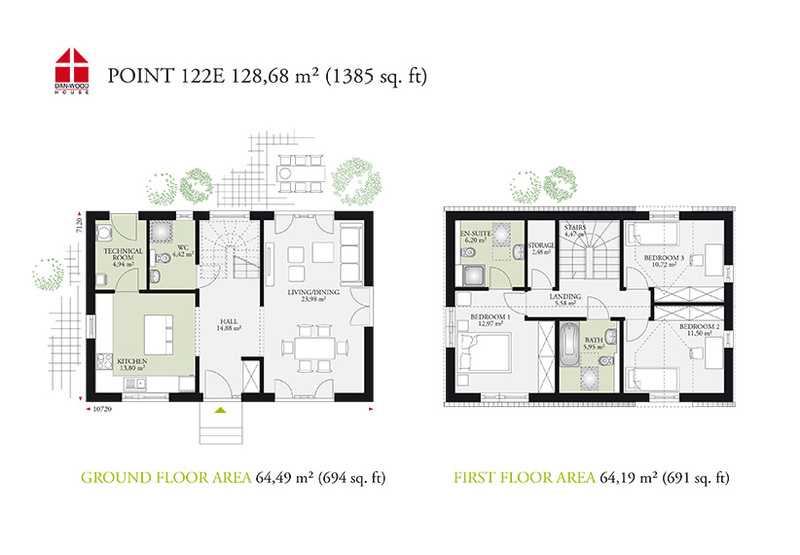 All sizes are approximate and downloadable floor plans are indicative only and may be customised and houses may also be enlarged or reduced, subject to planning. Houses are supplied by Dan-Wood, one of Europe's leading custom build house builders, supplying well over 1,000 houses each year and employing over 1,400 people. Price : from £347,239 positioned on a plot with a minimum value of £110,000. This wonderful 3-bedroom, detached, 1½-storey house house comes with master en-suite, open-plan living/dining area with outdoor access, large kitchen area, hall with statement staircase, family bathroom, WC, storage and utility room. 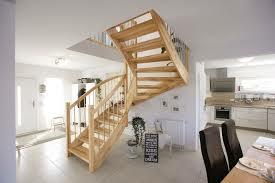 The wooden staircase is a central feature and a real talking point. The spacious kitchen area lends itself to a breakfast bar, the dining area is integrated into the open-plan living room. Price also includes slate look roof tiles (others available subject to planning), infrastructure, foundations, on-site services, basic landscaping, planning and building warrant. Price : from £364,347 positioned on a plot with a minimum value of £110,000. 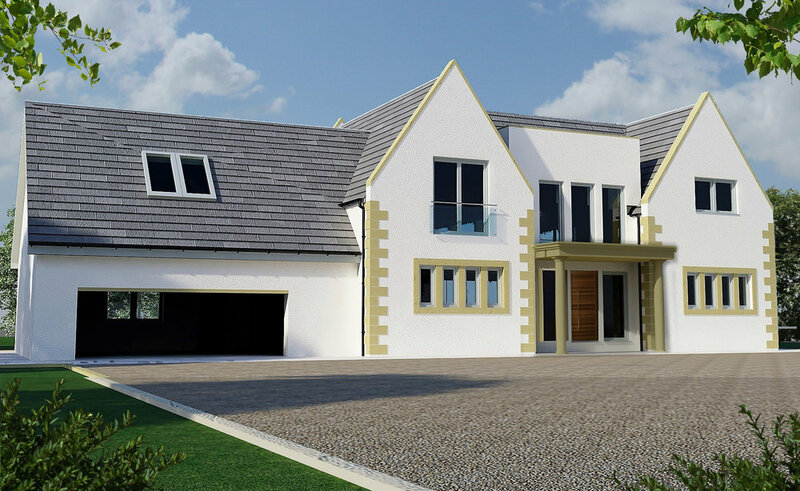 A fabulous 4-bedroom detached, 1.5-storey house with entrance hall, open-plan living/dining room with outdoor access, large kitchen, WC, technical room, double bedroom with en-suite, three single bedrooms and family bathroom. The clever design of this house lies in the open-plan living and dining space arranged over 33 sq/m with double doors to the outside at both ends. Across the hall on the other side is a large kitchen area, a utility room and WC/shower room. 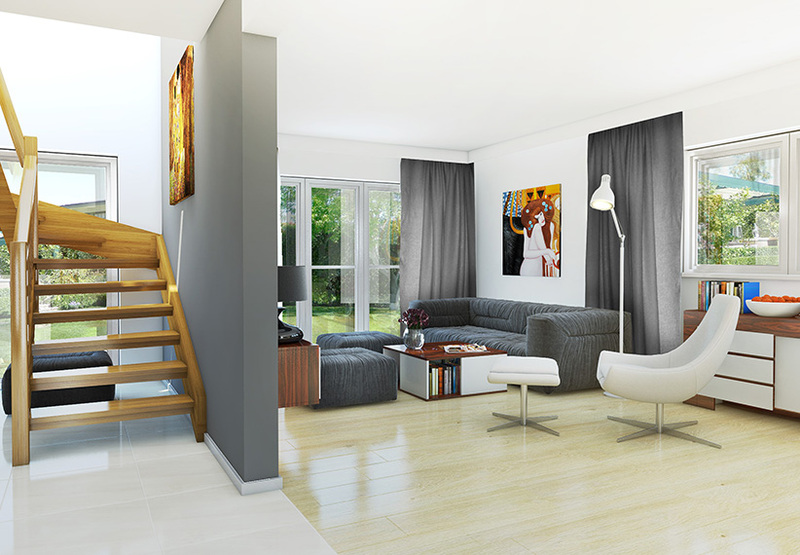 The spacious hallway adds to the open-plan design, with a twisting staircase making a stunning central focal point. Price also includes slate look roof tiles (others available subject to planning), infrastructure, foundations, on-site services, basic landscaping, planning and building warrant. Does not include kitchen. 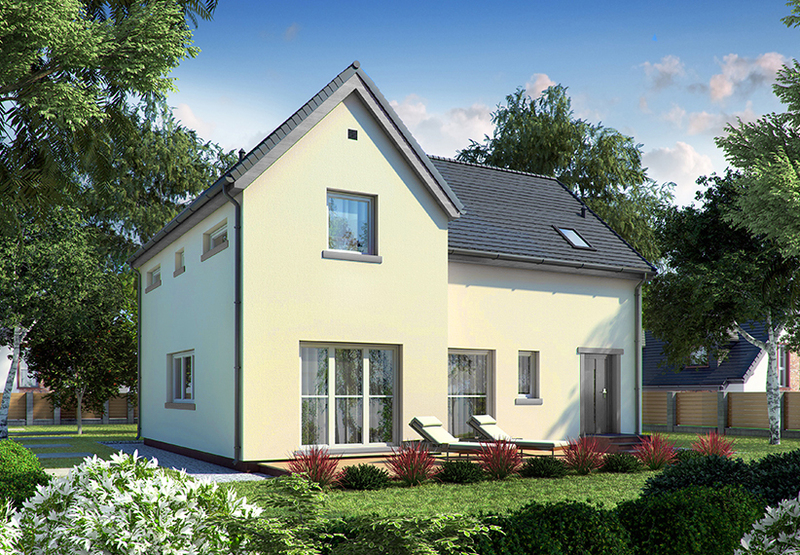 Price : from £379,998 positioned on a plot with a minimum value of £130,000. A beautiful 4-bedroom, detached 1.5-storey house with living room that has outdoor access, a large kitchen area, open-plan entrance hall with staircase, a master bedroom with two spacious walk-in wardrobes, a family bathroom, WC and large utility room. This house has everything you need for a growing family in a neat, compact design. If you like ‘his’ and ‘hers’ designs then you’ll love the two spacious walk-in wardrobe and dressing areas off the main bedroom. Price also includes slate look roof tiles (others available subject to planning), infrastructure, foundations, on-site services, basic landscaping, planning and building warrant. Does not include a kitchen. Price : from £397,792 positioned on a plot with a minimum value of £130,000 plot. A wonderful 1.5-storey detached, 5-bedroom family home with open-plan living/dining/kitchen area, study, utility room, WC/shower room, master bedroom with en-suite and family bathroom. With five bedrooms this stylish home is ideal for large families or regular visitors. 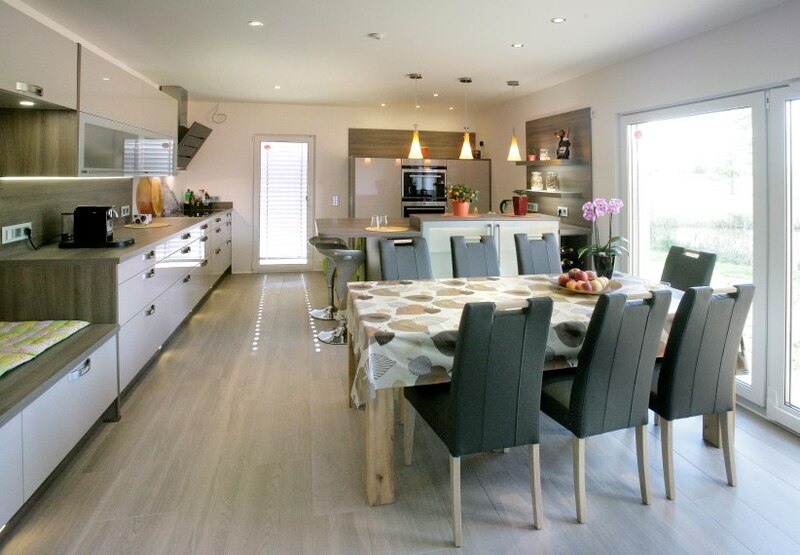 The living, dining room and kitchen area are all open-plan providing plenty of space for family time and entertaining. A spacious study on the ground floor is perfect for home-owners or could make a hobby room, a den or an extra bedroom. Price also includes slate look roof tiles (others available subject to planning), infrastructure, foundations, on-site services, basic landscaping, planning and building warrant. Does not include a kitchen. Price : from £473,038 positioned on a plot with a minimum value of £130,000 plot. 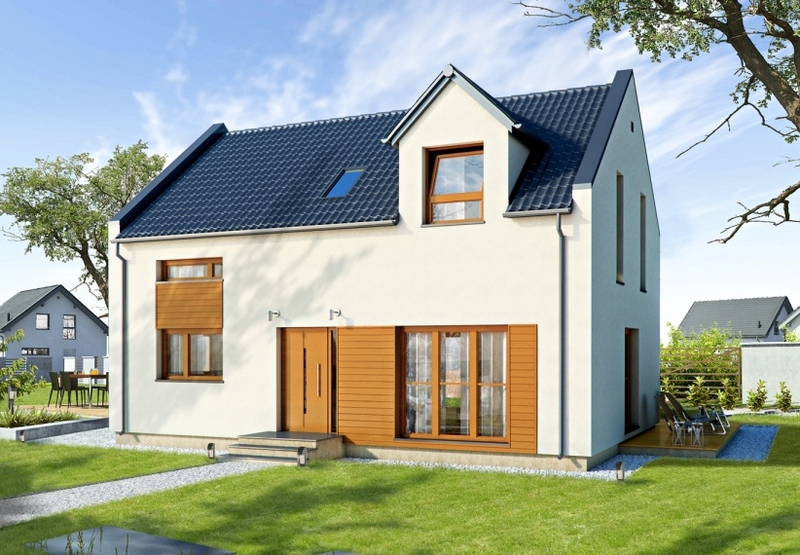 This impression 5-bedroom, detached 1.5-storey house boast a stunning living/dining room space with adjoining 20m² family room with outdoor access. It has an open-plan hall with statement staircase, kitchen area with space for a breakfast bar, a single bedroom and study downstairs, three double bedrooms upstairs with master en-suite and walk-in wardrobe, a family bathroom, storage, WC and utility room.The single bedroom downstairs could be used as a study as it is on the other side of the main living area if you need some quiet time! Price also includes slate look roof tiles (others available subject to planning), infrastructure, foundations, on-site services, basic landscaping, planning and building warrant. Does not include a kitchen. Price : from £498,555 positioned on a plot with a minimum value of £130,000. An outstanding and impressive 5-bedroom/study, detached 1.5-storey house with open-plan entrance hall/living/dining area with statement staircase and outdoor access, kitchen area with space for cooking island, a master bedroom with an en-suite bathroom and walk-in wardrobe, a mezzanine gallery with balcony, family bathroom, WC and spacious utility room. The house has eaves on all sides which makes a dramatic statement while ensuring maximum thermal efficiency. If you like to work from home then, a 21sq/m room on the ground floor will provide you with a substantial space to do so. Equally it could serve as an additional bedroom or a separate sitting room. The mezzanine gallery overlooks the main living area and has a stylish wooden and glass balustrade. Two of the bedrooms upstairs have access to the balcony at the front of the house. Price also includes slate look roof tiles (others available subject to planning), infrastructure, foundations, on-site services, basic landscaping, planning and building warrant. Does not include a kitchen. Price : from £395,061 positioned on a plot with a minimum value of £130,000. This lovely 2-storey, 4-bedroom detached house has an open-plan living/dining area with adjoining breakfast room and kitchen area with space for a breakfast bar, solid wood staircase master bedroom with en-suite bathroom and walk-in wardrobe/dressing room, family bathroom, utility room, WC and storage. This home is the epitome of open-plan living. The kitchen which with its spacious breakfast living rooms are all open- plan. A wooden staircase sits at the center and leads to a master bedroom with en-suite bathroom and dressing room, a family bathroom, extra storage and three additional bedrooms. Price also includes slate look roof tiles (others available subject to planning), infrastructure, foundations, on-site services, basic landscaping, planning and building warrant. Does not include a kitchen. Price : from £490,401 positioned on a plot with a minimum value of £130,000. A popular 2-storey, 5-bedroom detached family home, 34m² living room with outdoor access, combined kitchen/dining room with space for cooking island, 18m² family room, hall with statement staircase, master bedroom with en-suite, family bathroom, wardrobe, utility room, WC and double garage. This stunning house provides an impressive amount of living space, perfect for a big family or with frequent overnight guests. With so much space, there are plenty of opportunities to bring your own ideas and creativity to both the interior and exterior of this stylish and practical home. Price also includes slate look roof tiles (others available subject to planning), infrastructure, foundations, on-site services, basic landscaping, planning and building warrant. Does not include a kitchen. Our bespoke houses with sizes of 3,400sq/ft or more can also be designed within the materials' palette of the site that have been agreed with the planners, and within the Plot Passport constraints of your chosen plot. Prices start from £360,000. Please contact us for more details.